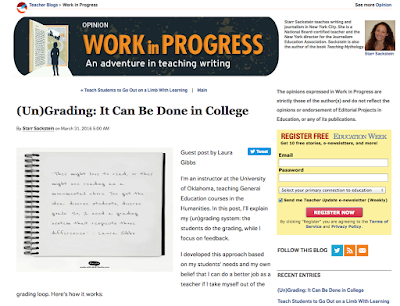 I've created this post as an omnibus of resources to accompany my guest post for Starr Sackstein's EdWeek blog: (Un)Grading: It Can Be Done in College. For me, what the students say about (un)grading is the most persuasive evidence there can be. Here is a collection of student comments about grading from their end-of-semester course evaluations. And while you're at it, check out what the students say about creativity too. A big part of ungrading for me is unleashing student creativity! My assessment approach is all feedback - no grades, and I have collected a wealth of feedback resources, both for my own use and for my students to use here: Feedback Resources. If you have additional resources I should add, let me know. You can also follow my feedback work at my Canvas Community blog. Starr Sackstein is the author of Hacking Assessment: 10 Ways to Go Gradeless in a Traditional Grades School, which is a FANTASTIC book about alternatives to traditional grading. I highly recommend it! I read the Kindle version from Amazon. Another must-read book is Alfie Kohn's Punished by Rewards: The Trouble with Gold Stars, Incentive Plans, A's, Praise, and Other Bribes, also available as a Kindle from Amazon. Below is a list of articles I've bookmarked on grading/ungrading, and you can find more resources by following the #TTOG hashtag at Twitter. Plus you'll find more articles here: Feedback Resources (there's a specific section there about feedback versus grading). Why I Don't Grade, by Jesse Stommel. 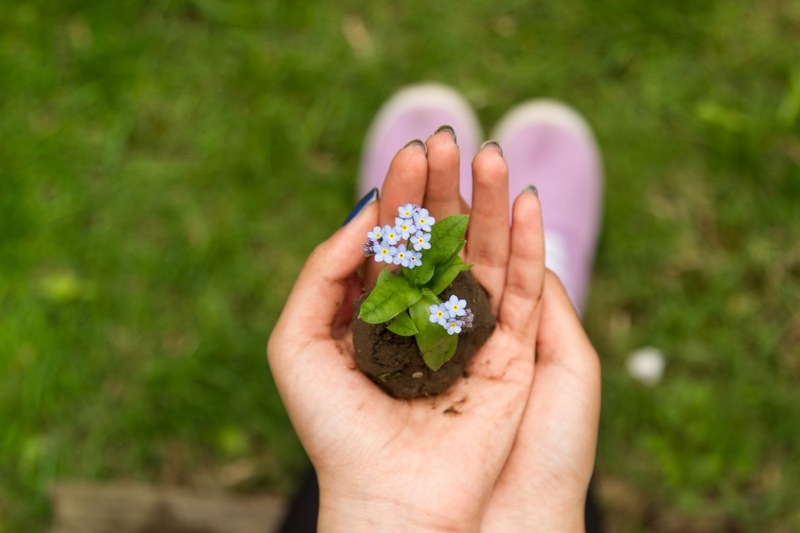 This beautiful piece is a great way to start re-thinking assumptions about grading, showing what damage grades can do and how they get in the way of real learning. Ungrading, by Susan D. Blum (in Inside Higher Ed). Formal education has led to a lack of learning in a number of ways, argues Susan D. Blum, and the one change that can make a big difference is getting rid of grades. This is a detailed article which identifies the wide range of problems caused by grading, and the ways in which you can solve these problems by going gradeless. The third [wish] is that there would be no grades. In that way, the measure of success would have to come from elsewhere--from application, satisfaction, from how well the learning actually works. As another of my touchstones, Frank Smith, says in his wonderful The Book of Learning and Forgetting, most learning--aside from in school--is continuous, effortless, independent of rewards and punishments, and never forgotten. It is only in schools that learning becomes so difficult, dependent on rewards and punishments, and easily forgotten. Mind/Shift's Katrina Schwartz: How Can Students Be Successful in a High Stakes World? No grades: Commenting on a piece of work forces students to internalize changes rather than focusing on exclusively on the grade. Mark Oppenheimer: There’s nothing wrong with grade inflation. Grades don't matter anyway. Here's why. Overall, graded students are less interested in the topic at hand and — and, for obvious, common-sense reasons — more inclined to pick the easiest possible task when given the chance. In higher ed we have a brutally standardized system. It doesn't matter what your interests are, what job you want, everyone takes the same courses in roughly the same time and at the end of the course you get ranked. Jeffrey Young (Chronicle): These Videos Could Change How You Think About Teaching. Profile of Michael Wesch, including his "not yet" grading; you'll also find his great video, here, "The Sleeper." 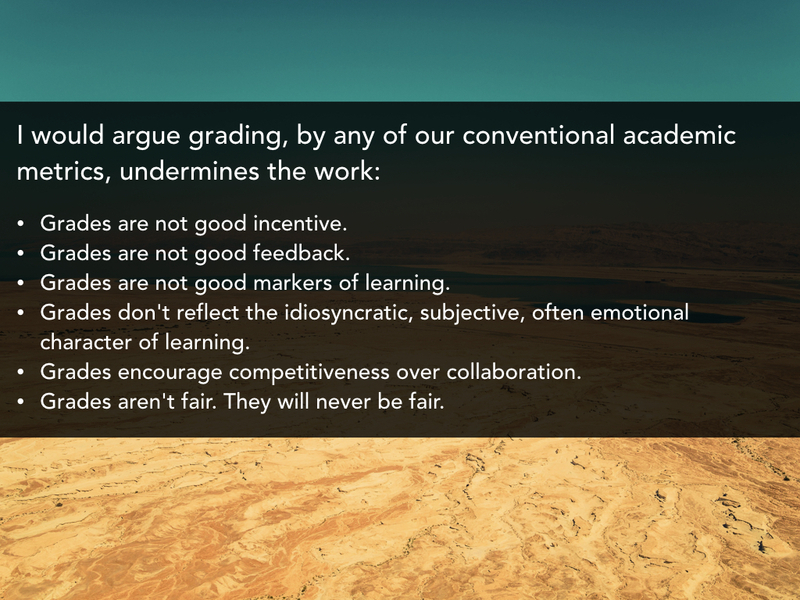 No Grading, More Learning. An article in IHE about Cathy Davidson: Her plan? Turn over grading to the students in the course, and get out of the grading business herself. Now that the course is finished, Davidson is giving an A+ to the concept. "It was spectacular, far exceeding my expectations," she said. "It would take a lot to get me back to a conventional form of grading ever again." 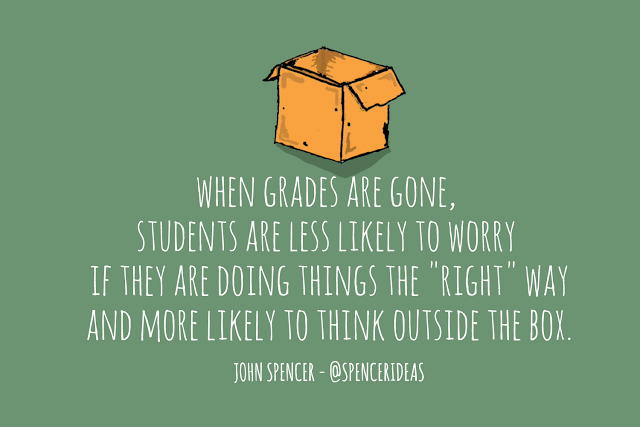 John Spencer: What Happens to Student Engagement When You Take Away Grades? Kids aren't concerned about compliance in a non-graded classroom. Don't get me wrong. There are deadlines. There are creative limitations. There are routines. I believe that limitations can be a part of what makes creativity thrive. 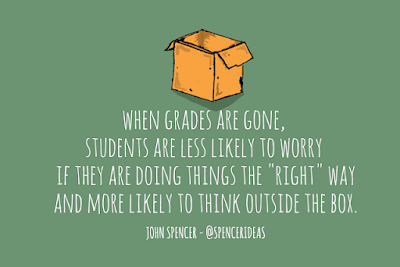 However, when grades are gone, students are less likely to worry if they are doing things the "right" way. And Twitter may give us only 140 characters, Christopher Moore is able to sum it all up in a single tweet: feedback is everything, grades only reveal our anxieties over the system of assessment turning against us. Lee Skallerup Bessette: Assessment as Care, Assessment of Care. 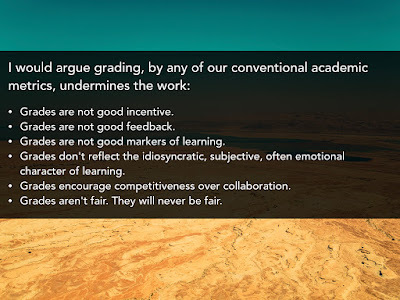 Lee's post offers a beautiful defense of assessment-as-conversation, something the vocabulary of ABCDF obviously does not support very well: Grading and assessment become conversations, instead of two competing monologues. Learning becomes the thing, instead of stand-ins for what learning could superficially look like. Also, check out this nice article in our student newspaper with remarks from me and from Rob Reynolds (he and I have been trading ideas about grading since we met at OU back in 1999): Test anxiety, grade inflation call traditional grading system into question by Lauren Massing. 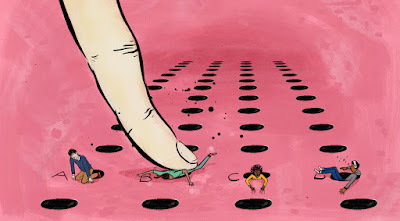 This Medium post by Arthur Chiaravalli is extremely useful, including reports on research by Hattie and others:Teachers Going Gradeless. Toward a Future of Growth Not Grades. I especially like the distinction here between gradeless as the decision to "grade less" or, alternatively, to proceed "without grades" entirely. Great piece by Jennifer Hurley about feedback, writing, and revision... and giving up rubrics: Why I Threw Away My Rubrics: "When we acknowledge our students as individuals, when we read their work with respect and openness, we can let go of the terrible psychic burden of being their judges and “executioners.” I no longer dread reading my students’ work. I am excited to see what they have to say and to see how I can help them. Try a semester without rubrics and grades, and you will never go back." Check out this great article by Ashley Lamb-Sinclair in The Atlantic: Why Grades Are Not Paramount to Achievement. 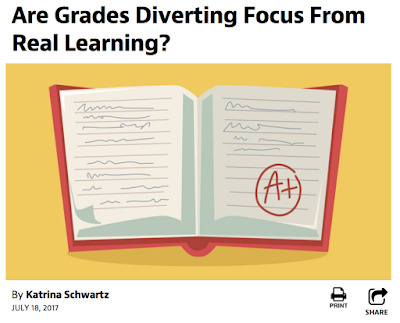 There's a write-up of her article by Katrina Schwartz at Mind/Shift: Are Grades Diverting Focus From Real Learning? I just asked this on twitter, but do you have examples of how to write the student Declarations? I simplified things this term, but want to go further. Just found this - what a wealth of information. As you know, I'm struggling with the actual practice (the philosophy I get!). I made one assignment self-assessed, and so many students just check the boxes even if they didn't do all that was assigned. So I'm going to look at all these resources carefully, and plan to go bigger with the whole idea, rather than going backward. You are a continual source of inspiration. Exactly - that's where I'm heading, being confident about increasing the number of tasks so that the "minimum" still means maximum exposure to the methods of the discipline, even if the task completion isn't perfect.